Bud Light’s medieval-ish “Dilly Dilly” TV spots are not showing the same perception gains as other parts of their fall “Famous Among Friends” campaign, according to YouGov BrandIndex. The beer maker began a three-week perception run-up at the end of October, hitting its highest mark with men since the February 2016 Super Bowl. However, the timing coincides with new non-“Dilly Dilly” ads that aired during two high-profile events on October 22: a rematch of the last two Super Bowl teams, the Patriots and the Falcons, and the Season 8 premiere of “The Walking Dead” on AMC. The second iteration of the “Dilly Dilly” campaign didn’t air until late November. 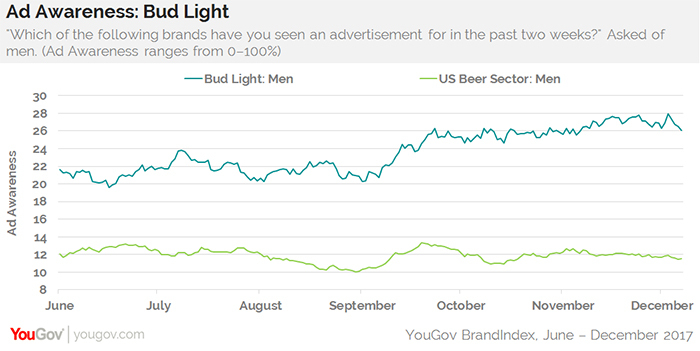 It didn’t seem to have any impact at all on Bud Light’s perception scores, which were already on their way back down from its November 17 peak. That date also coincided with Pittsburgh Steelers quarterback Ben Roethlisberger yelling a “Dilly Dilly” audible in his game against the Tennessee Titans. Even if the “Dilly Dilly” part of the campaign seems to be more hype than reality, Bud Light Ad Awareness benefited from all of their executions this fall. The beer maker’s Ad Awareness rose from 22% of all US men in August to a peak of 28% by mid-November. That equals Bud Light’s second-to-highest Ad Awareness level of the year, falling just short of its post-Super Bowl mark. 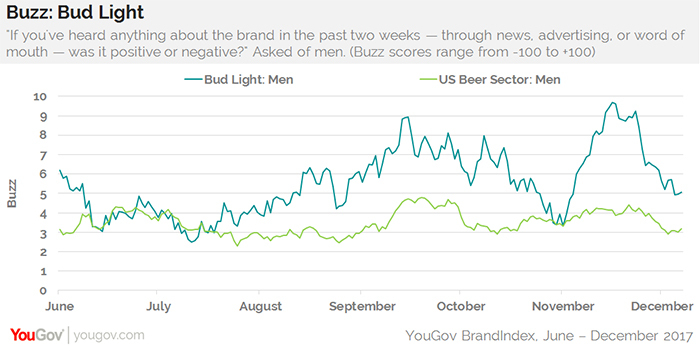 YouGov BrandIndex measured Bud Light and the US beer sector using its Buzz score, which asks respondents: "If you've heard anything about the brand in the last two weeks, through advertising, news or word of mouth, was it positive or negative?" A score can range from -100 to 100 with a zero score equaling a neutral position.